Musical Recommendations: Two drummers: Dan Weiss and Sebastian Rochford. I was nine years of age and I guess music was of interest to me for some reason. I settled on drum kit after trying out a few other instruments first. My earliest influences were the drummers I saw on TV, English pop and rock drummers. After that my influences were very much my teachers that saw me through my formative years to the age of 15. Slowly and over a long period of time. Its not something I am conscious of, or any musician needs to be conscious of necessarily, but as you get older and you change so does your playing. All sorts of influences can change your music, and maybe it becomes clearer in terms of which road ahead to take as you move and develop over time. But some aspects of your musical personality I suspect never change. To me the drums/drum kit/percussion are not one particular instrument per se, not like a trumpet or a violin so to me they’re not so critical. As far as I’m concerned as a drummer the sound is in your hands. So to a large degree you can and should be able to get a good sound out of pretty much anything. I feel to a large extent, and certainly compared to a lot of other instruments, as drummers we are allowed a degree of improvisation in so many professional situations. Composers are usually pretty non specific when dealing with drummers in terms of notation etc, however our role usually and ultimately ends up being very specific and prescribed as such in many colourful ways! Creating the right environment for our musical colleagues forms the basis of the whole band, and we have to do this every time. How we get there is usually through a creative perspective, even within music with complicated structures. It’s always been to become a better musician. To listen and therefore constantly to learn from others around you all the time. That’s a hard question to answer because firstly I don’t necessarily look at myself and consider myself as an improviser or a composer. I don’t have any specific hard and fast rules concerning this. And secondly it’s a huge and complex subject which I can’t attempt to answer in a couple of sentences. To always remember your job is to fill silence with sound, or not. And then to think of the sound around the sound, and so on and so forth. Working within each space within the music. I’m not sure what you mean by materials but of course finding different ways to play the instrument: to create sounds etc and then combine your sound world with your fellow colleagues is how we make music. Once the music is made there is still further manipulation that can take place if that's what you want to do, from simple mixing/mastering to all manner of sophisticated processing and skulduggery! I agree with this statement. Music is a team game and I like to feel and play as part of a team player. 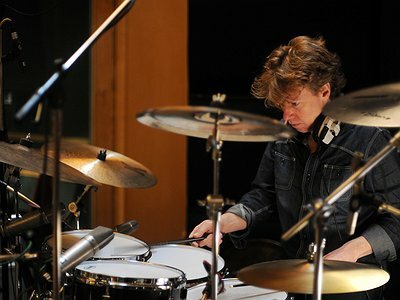 I have never played a solo concert, I know drummers who do which is very brave, but it depends how you see your role within music. I view it very much as an accompanying instrument working with and supporting other musicians. "To a large degree you can and should be able to get a good sound out of pretty much anything."